Hi everyone. Having fun with my Zig watercolour brushes again. Love them! 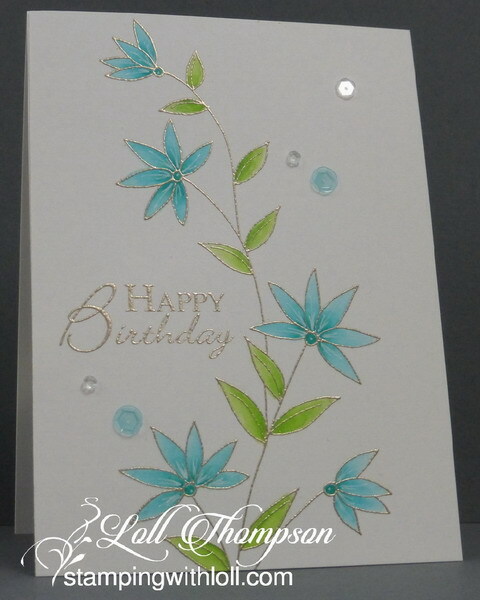 I stamped and heat embossed "delightful" from Penny Black in liquid platinum embossing powder on mixed media paper. I then watercoloured with my zigs, using a damp paint brush. I added some small dots with a white gel pen to the petals to give them some extra interest. The sentiment is also heat embossed in liquid platinum and sequins were added for a little sparkle. I'm happy with this one layer CAS Mix Up (mixed media) design, which includes stamping, heat embossing, and watercolouring. I'm entering this into Time Out Challenges #57 - Inspired by words "May all your weeds be wild flowers". Also entering into Penny Black and More Challenge - Anything Goes. I'm linking this card to AAA #65 - The 2nd Big Birthday Bash. Congrats to all the team as they celebrate this fantastic milestone! And I'm entering into Simon Says Wednesday - Anything Goes. I used a Technique Tuesday sentiment for the card above. I have added a new Pinterest Board. CAS Mixed Media has become a bit part of my life, so I decided to add a new board for that style of card. Would love for you to check it out if you have time. As well, I have been working on my blog post labels and have managed to reduce them from 322 (yikes!) to 117. :) I wish it could be less, but for now, I'm happy with 117. I have added them to the bottom of my blog for anyone looking for something in particular. Love that liquid platinum embossing...just so beautiful with those gorgeous colors, Loll! Beautiful shading on the flowers! Beautiful cards Loll. I love them both! That embossing podwer really adds a WOW factor. wonderful cards Loll - and i just started following most of your pin boards! Both of these are delightful, my friend! Love the soft colors and sweet simplicity! Both turned out beautifully! Love the colours you used and the perfect placement of the sequins (for some reason I really struggle with that!). Both of your heat embossed and Zig watercolored cards are gorgeous Loll. They really pop with your gold heat embossing. Your sequins are the perfect embellishments. I am the same as Susan... I struggle with the placement of sequins..lol! TFS my friend. What a beautiful card using this technique! Love the extra dots you added with the white gel pen, the gorgeous shading with Zigs and love the clean, neat all white background! I definitely will try this! Just catching up Loll - been on my travels again and a quick 3 day at home before another jaunt. two gorgeous cards Loll - how different they look just by using different colors - both are beautiful! Two beautiful cards Loll. 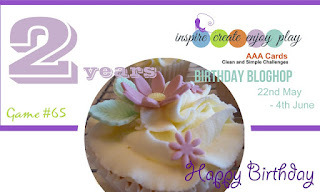 Love the platinum embossing and the colours you've used! Saw these on Pinterest and just fell in love with them both. Such pretty colors and I LOVE that stamp! Fantastic cards! Love the simplicity!! Simply gorgeous Loll! Have a wonderful Memorial Day weekend! I love the daintiness of the flowers painted with Zigs. Both colors look fantastic, Loll. 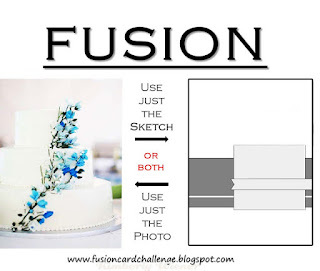 Have you considered entering the blue on in the Fusion challenge? Wow Loll, these are beautiful flowers, you colored them perfectly. So simple, yet so striking! So beautiful, the cards look likes sooo airy. A really lovely card and it's lovely to see you at Penny Black and More challenge , many thanks for joining in. With each stamp you can make a star of great stature. This seemed to be inconspicuous stamp created such a wonderful card. You're a great creator, I do not even wonder how you do it, it's just in you. I am very glad that I admire your wonderful works. Wow two absolutely beautiful cards, I love the stamp you used, its so fine and delicate and your colouring has complimented it so well. Beautiful CAS cards and lovely soft colours. Thank you for entering our challenge at Penny Black and More this month and we hope you will return next month. Love your colouring with your Zig markers. I'm partial to gold embossing with watercolouring mediums and your cards are stunning. Thanks for playing along for our Birthday Bash at AAA Cards! Two gorgeous cards, Loll! 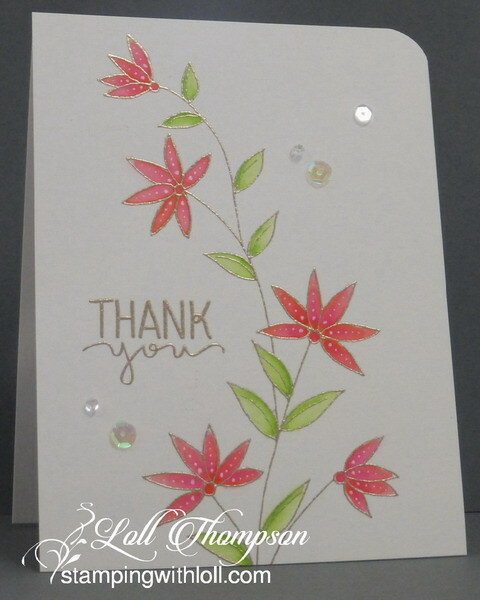 I love how you colored the flowers and leaves with your Zig markers, and using Liquid Platinum was such a great idea...so elegant! Two lovely cards, such a pretty floral stamp. Two beautiful cards, love both colourways. Beautiful cards, Loll. They are so soft and delicate and elegant - just gorgeous! 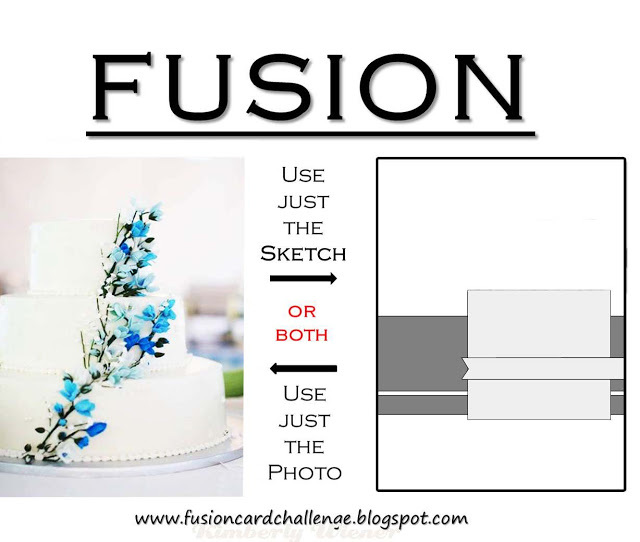 Thanks so much for joining us at Fusion Card Challenge.